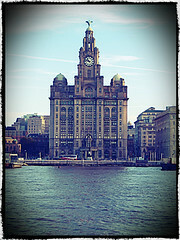 Liver Building, a photo by thehutch on Flickr. We all long to have a place we call home, a place where we belong and a place where we can ‘be ourselves’. For the first 20years of my life, home was in Liverpool – it is still a city that I love……but it is no longer home. These days my place of belonging is London…..it is a different city but one that is home. In the days of trouble, my memories remind me (falsely) of the calm and serene days back in Liverpool – the truth is that, wherever I am, there will be days of trouble. The issue to address is whether I am prepared to work through the problems and release the hope of a better future. London is home…..and despite some of the light and momentary troubles…..is the place that I belong.